coGalleries artist residency Berlin aims at stimulating exchange between international artists, curators, art organisations and art institutions. The program creates conditions for artists to succeed by offering professional support with networking, production, and presentation of their work. Each artist’s residency ends with a solo exhibition in our art gallery, located in the center of Berlin's famous gallery district. Residents will have 24/7 access to our 160 sqm artist studio loft and a smaller neighbouring private studio. The facilities are filled with natural light and the studio loft is equipped with a beautiful kitchen, bathroom, large work tables, and a cozy lounge area. The studio is a shared work-space, allowing for peer-to-peer exchange and potential collaborations between artists, researchers and curators. Located in vibrant east Berlin, the studio is part of the art compound FAHRBEREITSCHAFT, a dynamic environment surrounded by the work-spaces of emerging and established artists. The studio neighbors one of Berlin's leading contemporary private art collections, “Haubrok Collection”, a fine art printing studio "Artificial Image" and Berlin's finest art framer "Bilderrahmen Neumann". Furthermore, the compound houses several cultural and creative companies, a boat workshop, carpenters, a car repair shop, a corporate fashion company, a professional music studio and a dance crew. Our Berlin artist residency studio is just a 20 minute tram ride from our gallery space in the center of Berlin-Mitte. The Villa Heike is a three-story Prussian Villa, studio and office building in Berlin-Alt-Hohenschönhausen. The Prussian villa and the area surrounding it once belonged to the industrialist Richard Heike. From 1911 Heike began building a large industrial site consisting of a Machine Factory, a living and administrative building (the Villa Heike) and a factory storage. 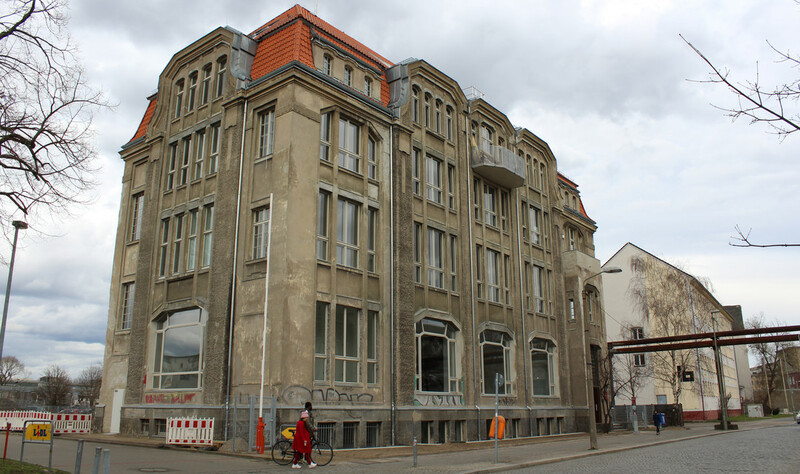 Heike lived on the top floor of administrative building with his family, while the rest of the building was used for administrative purposes as well as functioning as a showroom for his machines. After years of being abandoned, the Villa Heike was renovated in 2015 and was turned into a multi-functional building with large functional units, studio’s and offices. We are happy to announce that we can use a beautiful two room studio on the second floor of this rich-in-history building. The studio has big windows with a lot of natural light, a high ceiling and grande white walls to hang your artwork. This studio space will fit best for artist who focus on photography. We work closely with partnering galleries, public institutions, foundations, curators, art advisors, art organisations and visual artists within the field of contemporary arts throughout Europe, Africa, China, Brazil, USA and the Middle East. Further down the page you can find updated open call postings for our international residency programs. Principally, we do our very best to support the residency artists as good as possible. Of course the quality of the collaboration will be strengthened by proactive artists who put effort in interacting with us during their stay. Residency artists will meet insiders of the art world through a series of external studio visits, gallery tours, panel discussions, portfolio viewings, openings, and other art-related events. They will also have the opportunity to work with our partnered exhibition spaces in Berlin and other cities. Each artist in residence is given the opportunity to present their work in a solo exhibition at our gallery space and at a private open studio event or studio dinner. The open studio event will be scheduled during the residency, the final solo exhibition towards the end of the resident’s stay. Besides that, we support each resident in finding further opportunities in other group shows during the residency program or afterwards. Residence activities such as artist-led workshops, studio visits, video screenings, artist talks, and performances can be hosted in either our gallery space, our studio loft or a partnering institution or art space. We ensure that our residents gain insight and connections into Berlin’s vibrant art scene. We are looking for inspiring and professional artists, researchers, and curators to support the residents’ projects through meaningful discussion, critical feedback, and curatorial suggestions. coGalleries works to broaden its local and international network through these personal interactions. We assist residents in realising artistically and technically complex projects and provide them a support base by helping with translations, sales, promotion and organisation. We like to emphasize that we don’t run the residency program to make a profit as the fee is used to cover the costs we have while providing the program. All studios are equipped with high speed internet, a printer, and all necessary tools for working with wood, clay, paper, etc. (the materials themselves are not included). We would like to emphasize that we are looking for professional international artists to collaborate with. Our team has a long track record in commercial and non-commercial practices. However, with our artist in residency program we strive to boost artistic careers and provide value and connections. coGalleries connects to art collectors, curators, and artists to offer support and feedback and to foster new connections for all of us. Artists will become part of Berlin’s international arts community and gain sight in the Berlin art world and beyond. We explicitly do not focus on any particular media, but rather on encouraging conversation, dialogue and exchange across disciplines. We accept artists from a range of backgrounds such as painting, sculpture, photography, urban art, installation, performing arts, video, literature, research-based practices, as well as curatorial projects. Artist collectives and groups are also encouraged to apply. We welcome applications at all times, as residents are accepted on a rolling bases. The primary languages during the artist residency are English and German, but we also handle fluently Spanish, Portuguese, and Chinese. All residents can apply via the application form. We accept applications on a rolling basis but also run open calls on specific topics. We are well-planned ahead but also allow a high level of spontaneity. We always try to make it happen. Please apply by filling out the application form. Make sure to include a CV, as well as a minimum of 3 .jpg images showing your artistic process and exhibition documentation. Granted your selection, these images will be used on our social media channels, e-mail campaigns, print invitations, websites and catalogues. File names should include exactly in this order your first and last name, the title of the work, the year and the photo credits. We suggest residents to seek funding in advance through grants and sponsorships. Soon you will find a list here with funding opportunities for scholarships, stipends, fellowships, and grants that are offered internationally. ✉️ Sign up to our Residency Newsletter and be the first one to know about our new Open Calls and Artist Opportunities by clicking here. New York based artist Juliana Cerqueira Leite preparing a major solo show for London. Our current artist in residence Waldek Dynerman is a sculptor and a painter, and arranges his work as mixed media installations. His themes evolve around the critique of power structures, and are also intensely personal. He mixes genres and materials in pursuit of freedom from conceptual and aesthetic clichés. Our current artist in residence Giovanni De Benedetto working on his next exhibition PREMATURE. He is an Italian visual artist and musician who makes contemporary abstract mixed-media original artworks. His projects have multiple points of view and the observer/listener is an active part of the creative process where each artwork/piece is made with the intention of provoking a reaction into the spectator. Art Exhibition "Fassaden" by Arthur Laidlaw from London at our art gallery in Berlin-Mitte. Croatian artist Diana Zrnic's work for her exhibition "Seeking For..." at coGalleries. Painter Tahian Bhering hosting an Art Brunch in our gallery.